Of course I don't laugh or know how to laugh at people's misery or misfortune but, at the same time, I won't blame those gloating over the plight of these Zamfarans. One of the most stupid things to believe is that attaining or retaining "power" solves all problems. An average northerner(especially the ones from northwest and the muslim part of northeast) is ever boastful of power he/she may not be gaining from. The "north" is still in a deep slumber! Thank you, prof. for your everyday concerns on the betterment of this Nation. Hmmm,Only a few knows that this so call our great Nation has been decayed beyond it physical portrait. Nigeria only had one problem, which is 'life'. Any Nation that pays little or no attention to the life of it people(citizen) can never and never succeed. If compared to other Nations in term of this Nigeria is ranked No.1. Any Nation that cherished life as automatically cherished; political, Economical and social well-being of it people. Many life are still on the track my blood still going to be shed. Sir, Nigeria is millions-time away from be a successful Nation. Soon or later we will deliver ourselves. Even a well structured Nation needs revolution much less the anarchy ones. The killings in zamfara are a punishment from god. Did you know that fourty or so qurans were found in the toilet? The people that kidnapped the preacher fought themselves and vowed to quit kidnapping.in the northwest Your only business with almajiri is if you have leftovers or need some child labour. Buhari ever utter almajiri even though it is a foundational problem? You write with such gusto, that I shudder what will the literary space be like, when you earlier announced you were not going to engage again on Nigeria bad governance issues again. Thank goodness, you rescinded that earlier stance. Thank you for constantly bringing the issues to the fore. The situation is pathetic. Initially I said I won't pity the victims because they had an opportunity to help themselves but rejected it and chose to support a President who lacks the wherewithal to give orders to his unperforming service chiefs. He can't sack them either. To make matters worse, they are the ones dictating things to him. But, I changed my mind after I saw a video of a cleric talking on Zamfara killings. He made several illogical attempts to exonerate the President. It was full of lies. There were no facts, no evidence absolutely nothing to justify his assertions. All the people could do was chorus "Allahu Akbar". Nobody asked any question. Nobody even doubted what he was saying. That was when I understood the mystery behind Buhari's unquestionable support in the north. Someone who use to teach the people about Allah will just say all manner of things to make people support Buhari. He will not use any evidence nor quote any authority, and the people will just accept it the way they accepted religious teaching without questioning anything because it is from Allah . In summary, the people are actually victims of a religious class. Believe me, very soon, the clerics will rationalize the killings as test from Allah. The people will be taught to accept the killings, die in silence and pray. They will be condition to believe that blaming the President or calling on him to act is a sin. Happily for those of us who ARE in Nigeria, some of your "facts" are very inaccurate. (1) Buhari is not as insensitive to the communal crises in Nigeria as you'd like the world to believe. 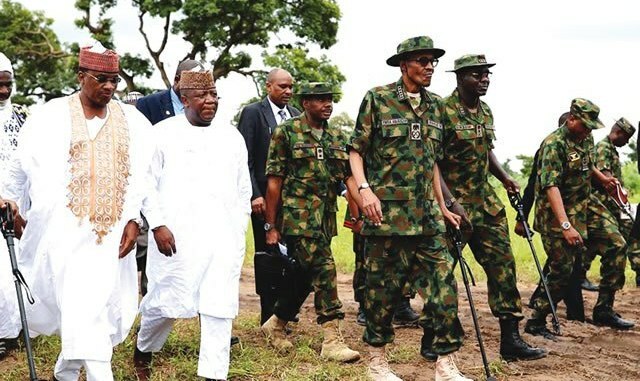 By your own admission, he had visited some crisis areas and has done as much as he could to support the security agencies to fight crime in the country, including the insurgency in the NE and banditry in the NW. He need not go to every troubled spot in the country. (2) Buhari is not selfish. He has concern for every Nigerian. Vice President Osinbajo has even said Buhari is poorer today than when he first became President. Buhari has pumped huge sums of money to all levels of government for the payment of salaries and pensions left behind by the previous PDP government, despite leaner resources. He's a caring president. (3) The specific problem of Zamfara, like the other crises in the country, predates the Buhari administration. He inherited it. It's absurd to claim, as you did, that he is unconcerned about the crisis there because it's being perpetrated by his Fulani kinsmen. There's no evidence of this. Whether in Plateau, Benue, Taraba, Adamawa, Zamfara or other states, he's openly condemned the farmer-herder clashes as acts of criminality which must be treated as such. I think most right-thinking Nigerians know the real facts about their country more than you do. You may have other grounds to hate Buhari, but not the flimsy ones you present above. So, while some blame Buhari for the mayhem in Zamfara State, the people of that state lay most of blame squarely at the foot of the inept governor Yari. Zamfara was the first to declare full Sharia in 1999, followed by 11 other northern states, with the expectation that Sharia would usher in the era of peace, prosperity, justice and development. Twenty years on, the state remains one of the poorest in the country, racked by mostly Muslim-Muslim slaughter, despite huge resources given to the state. Apt as always. Thanks Prof. I don't, as a matter of principle, gloat over people's suffering but I'm definitely angry with the voters of Zamfara state and it is affecting my attitude towards what is happening there. I find is very hard to believe that with all that was said about Gov Yari in the past four years, the people there still voted for him to go to the senate. And they still voted for APC in the governorship and presidential election. If the people there cannot seize the one single opportunity they got to snub Yari, I don't find it worthwhile wasting my time on their issues and sufferings. The northern masses are doomed because they enable bad leadership all by themselves. Kidnapping is now a scourge of the whole north not just the northwest and rural people are even the worst victims. There is a state of siege at the moment throughout the north. After the next four years, even Buhari's most passionate supporters will realise what a scammer he is. Prof, you write amazingly. Your writing has great qualities. The article is as objective as it can possibly be, given the shape of events.